Sunday, June 10 at 7:00 pm. 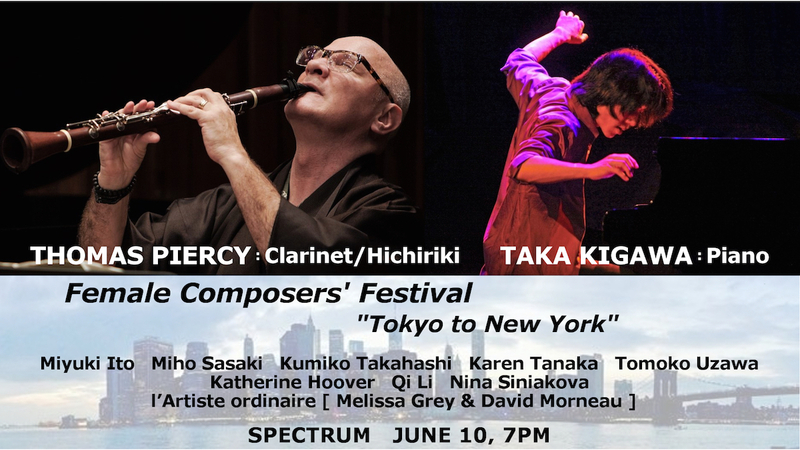 Tokyo to New York is a one-hour concert featuring new music by New York- and Tokyo-based composers. This installment features prominent musician Thomas Piercy on clarinet and hichiriki teaming up with critically acclaimed classical pianist Taka Kigawa. Together they will perform pieces written by female composers. Nina SINIAKOVA – “Sensu” for clarinet and piano. Spectrum has been one of New York City’s preeminent venues for innovative, experimental, and avant-garde music since 2012, giving special consideration to music that they feel is under-represented in the U.S.